Japanese Episode DP 166: "Takeoff! Nagisa Tower!!" American Episode 1309: "The Fleeing Tower of Sunyshore!" Now that Satoshi has woken Denji from his malaise, his battle for the Nagisa City Gym Badge can commence! Just as a battle between Denji's Röntora and Satoshi's Hayashigame begins, Nagisa City suffers a blackout, so the battle is put on hold. After failing to restore the power himself, Denji deduces that there must be a problem with the Nagisa Tower. A quick trip to the tower reveals that the Rocket-Dan have taken it over and are planning to give it to their boss! They attach the tower to a rocket and prepare to launch it into space, so Satoshi and Denji hurry to grab onto it. After climbing their way up the side of the rocket, the two trainers reach the interior of the tower. Thanks to the fact that Denji designed the tower, the Gym Leader is able to lead Satoshi to the Rocket-Dan's control room. Once there, a battle breaks out, and Satoshi's Hayashigame evolves into Dodaitoise! Before long, the Rocket-Dan is ejected from the rocket. Back on earth, power is restored to Nagisa City due to the efforts of its citizens. Above, Denji takes the controls of the rocket and is able to successfully return the tower back to its original position. 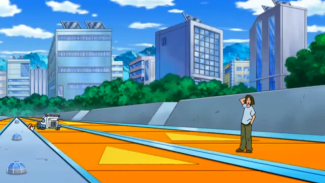 The damage caused to the Nagisa City Gym has been great, so Denji asks Satoshi if they can postpone their gym battle until they can get it fixed. Satoshi agrees, so the gang decides to head toward Risshi Lake to cheer Hikari on in the Grand Festival. This is kind of a weird one. The TV producers decide to postpone Denji's battle with Satoshi, for some reason, and devote most of the episode to another rocket-powered scheme (I guess the less than half a year wait since the Togepi episode was too long? ) and the evolution of one of Satoshi's pokemon. This is an entertaining episode, sure, but it's also an episode that feels a little awkward to me. It's hard to explain. Something that I was trying to do while watching this episode is figure out when exactly this episode took place. The repeated footage during the cold opening makes it seem like the battle with Denji happened immediately after the battle with Ohba, but that doesn't really make sense to me. Even if that was true - and I really don't see Denji being the kind of person to not let his opponent's pokemon rest properly - then how in the world is Pikachu running around the way it is? It got beaten down pretty badly by Ohba's Goukazaru, yet here it is, acting as if nothing happened. The similarities between Nagisa City and the city from the second Advanced Generation movie, The Sky-Splitting Visitor, Deoxys, continue. In this installment, the power goes out, only this time everyone's Monster Balls are still functioning. One moment I found hilarious was the part where the people on the moving sidewalks discover that their mode of transportation is no longer functioning. The guy in the picture below, especially, looks absolutely perplexed by the situation in which he finds himself. "No moving sidewalk?" he thinks to himself. "Then how in the world am I supposed to get where I need to go? Use my legs!?" I also find it a bit curious that the producers of the TV series didn't include solar cars, as this would have been the perfect time to do so. The Nagisa Tower, according to Bulbapedia, is based on the Tower of the Sun. As you can see from the article, the tower casts the same silhouette as the Nagisa Tower, has a conductor, and features lighting symbols on the side. And, of course, is named after that big ball of gas that supplies Nagisa City with all its power. It's also reopening to the public in 2010, the year this episode debuted in Japan, so now seems like as good a time as any to break out this reference. I feel like I should mention Hayashigame's evolution, since it is a major event in this episode, but I really don't know what I can talk about. The pokemon evolved. The end. It would have been nice to see the evolution get a little more attention - Goukazaru got a vocal song, after all - but what can you do? I feel like the writers for the English version had a lot of fun writing for Volkner and (especially) Flint. Not content with straight-up translations, they give both men a way of speaking very close to the way actual humans talk. In an age of antagonists with an affection for applying an abundant amount of alliteration, listening to Volkner and Flint talking to one another is refreshing. I'm also very amused by Torterra's dub voice because half the time, it sounds like pokemon's calling out to protagonist from Final Fantasy III or to voice actor Tara Strong. I don't know about you, but I'm looking forward to listening to this pokemon for the rest of this season. Musashi: ""Ittai nan nanda yo kore wa" no koe o kiki!" Kojirou: "Bibitto denpa no hayasa de yatte kita!" Musashi: "When we hear a voice saying "what in the world is this!?"" Kojirou: "We show up at the speed of electric waves." Jessie: "Listen, to the wisdom from the top of the tower." James: "Our diabolical plan is beginning to flower." Jessie: "There's no electricity over there." James: "And wouldn't you know? None over there!" Jessie: "A blackout by any other name's just as black." James: "When it comes to chaos, we've got the knack." Another thing about the English version worth mentioning is that both James and Meowth sing along to the background music. They do this in the Japanese version as well, but the English version has the duo sing a few more notes than the Japanese version does. Joy: "Unfortunately, there are a lot of Pokémon here that need serious care, and they can't afford to be without it much longer." Originally, Joi tells Junsa that there are a lot of pokemon who have taken a lot of damage and a lot who have just hatched from eggs. The dub omits the egg part. Volkner: "Ash, I feel badly that our gym battle was so rudely interrupted. Please forgive me." Ash: "Hey, no problem. We've gotta get the tower back, so don't worry about it." Volkner: "Right! Our sunny shores must be protected!" Ash: "Is that where the name comes from?" Volkner: "You hit it right on the head. Sunyshore City is known for its bright sunlight. It's the perfect name for a perfect city." The first two lines are accurate translations, but the rest of it isn't. Denji's second line there has him recite the city's motto from the games, Taiyou ga terasu machi (たいようが てらす まち), or "The city illuminated by the sun." The equivalent in the English versions of the games, as seen on the sign at the city's entrance, is "Solar Powered!" I'm quite confident that TPCI knew this (after all, they picked up on Volkner's in-game nickname in the previous episode) but chose not to use it because having him randomly blurt out "Solar Powered!" would have made him look like a psychopath. So they made up a new explanation instead. Volkner also builds up Sunyshore City as "a perfect city," something that his Japanese counterpart doesn't. Volkner: "We're fine Ash! Please try and have a little faith in me! After all, remember, I did build this tower." Originally, Denji asks Satoshi to have faith in the tower that he built, not in him. He then states that he'll definitely return the tower to its original spot.